Everyone thinks it's real! It's a true touch of the great southwest. Lend a welcoming and warm feel to your den with this intriguing van Leeuwenhoek rug from Carbon Loft. 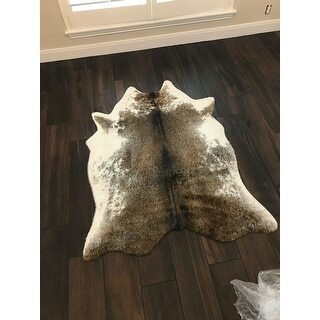 Designed to mimic the look and feel of rawhide, this power-loomed rug is crafted from acrylic, faux fur, and faux rawhide for lodge style. The animal skin pattern is rendered in ivory and brown, completing the rustic appeal of this free form rug. This rug looks amazing! I bought it for my bedroom and it looks and feels real. It came in the exact size it claims to be. Great coloring and pattern as well. It looks just as the picture above describes. I definitely recommend it. Wow! Very pleased with this Faux Rawhide rug. Beautiful, natural colors. Yes the rug is thin but very much like rawhide which also tend to be thin. So, not a problem and no slippage on my vinyl plank flooring. I love it! I ordered this to cover a loft area. My original rug was about 60 inches wide by about 46. I thought I would try this one, even though it had irregular borders. But its a little too small, so I'm buying a bigger size. The color is great, exactly as pictured and when I get the new one, I'm going to keep it, or even put both together. It is a little thin, not very fluffy, just fyi. So if you want something thick to sink your feet into, this isn't the rug. Happy with the fast shipping too. Love this rug! It’s on the thinner side but that’s what I was looking for without paying hundreds of dollars for a real hide. The colors are authentic and I couldn’t be happier. 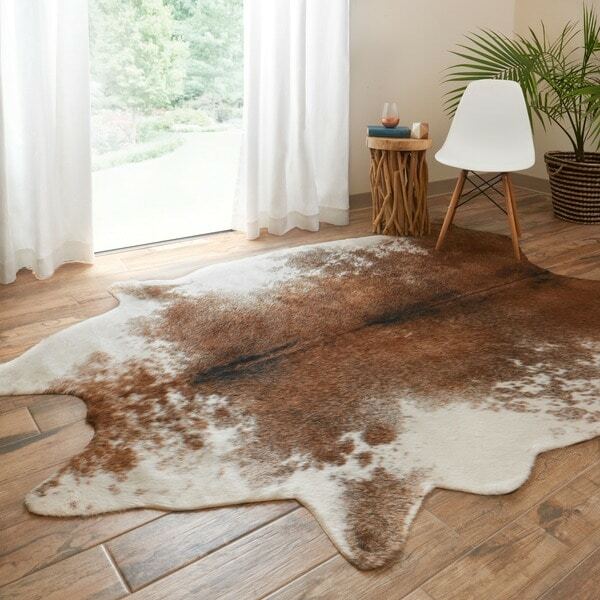 This Faux Rawhide rug is exactly what we were looking for. 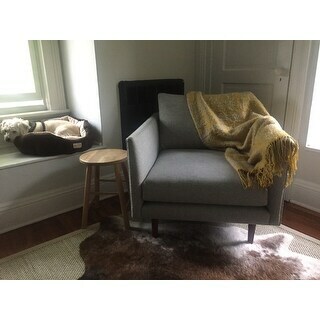 Our style is mid century modern and It fits our corner reading area perfectly. It's great for a small corner space. The colors are beautiful and it is really soft. It is easy to vacuum and looks so good. I wish they had a bigger size. 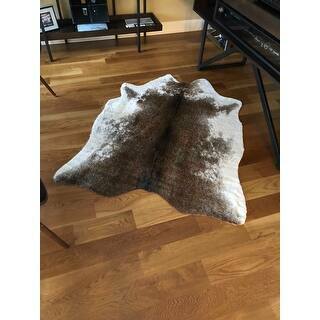 This product is obviously a faux fur rug, but the rug is beautiful. The colors, weight, and cut are very natural looking--and I don't have to worry about my dogs eating it! You really can't go wrong with this rug. I am extremely sensitive to smells and in case anyone is wondering, this rug has no odor at all. Love this rug! It is so beautiful in real life, the colors are very warm and the carpet is very soft. We’ve had a number of people inquire where we got this rug. 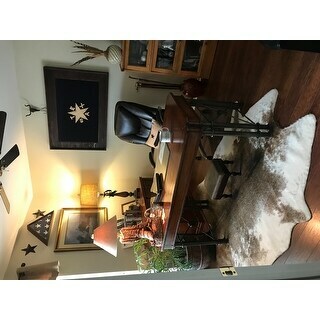 Looks great in my office with the rustic decor. The colors are great and it’s soft even as a faux skin rug. 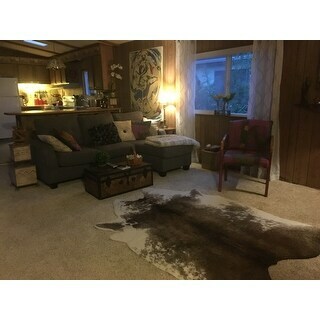 The rug was just as shown in the picture and we are very happy with it! The size was perfect for our room and looks like real skin rug without the worry! 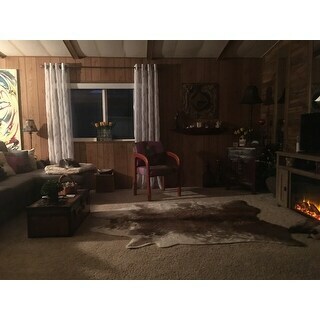 This is the second rug that I bought like this and I absolutely love it. It was just what I needed to finish my husbands office. The quality is good and it adds just enough elegance to any room. LOVE this rug!!! It looks and feels like the real deal. It’s a little thin but it won’t be in a high traffic area so I’m not to worried about it. It looks small in picture but it’s perfect 3x5. Beautiful colors however would never lay flat. As another reviewer stated, it seems as though the edges are too tight to allow the center to be flat. Very pleased with this rug! Super easy to clean, even my neato robot vaccum brushes over it with ease. Great size and quality. 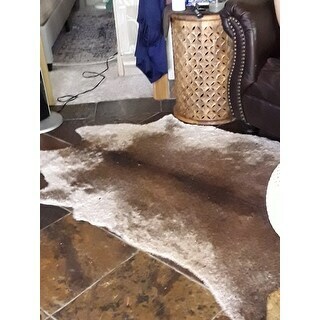 This rug also does not look "cheapish" like some cowhide rugs can. 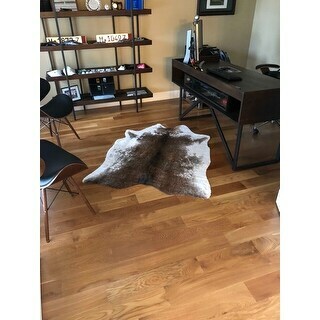 This rug is exactly what I was looking for! Looks authentic & feels like it too. I’m dead set on the real thing but love the faux product. Keep in mind the dementions are from extremity to extremity. I’m obsessed with this rug. Love it. It’s great for a small area. Loved it! Great size! Great colors. Exactly as pictured. Perfect addition to the room! Order arrives very well packaged and even came early! Pretty good for a faux cow skin hide. It seems to be more durable than a real one and is a much larger size (which I needed) than a real one. It’s cute and looks great in my home office. It definitely needs a pad underneath because it’s very thin. "How do i clean this?" We recommend spot treating when necessary or professional cleaning.